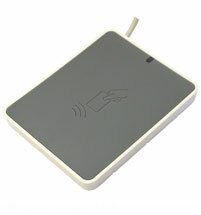 The uTrust 3700F is a 13.56 MHz contactless and NFC reader ideal for environments where mixed credentials and form factors are in use. Supporting ISO 14443 as well as ISO 18092 cards, tokens and NFC-enabled smart phones, this reader provides seamless operation between traditional contactless technologies and emerging NFC applications. Previously known as the Cloud 3700F. Offering Windows, Mac, Linux and Android driver support, the uTrust 3700F is ideal for applications including network log-on, secure web-based transactions and NFC-based applications such as loyalty programs. The Cloud 3700F replaces the popular SCL011 reader. Firmware upgradable.